To make a tax-deductible donation through Paypal. Click on the Donate Now button. by our our generous Challenge Donors!! Up to $20,018!! Double your impact today! 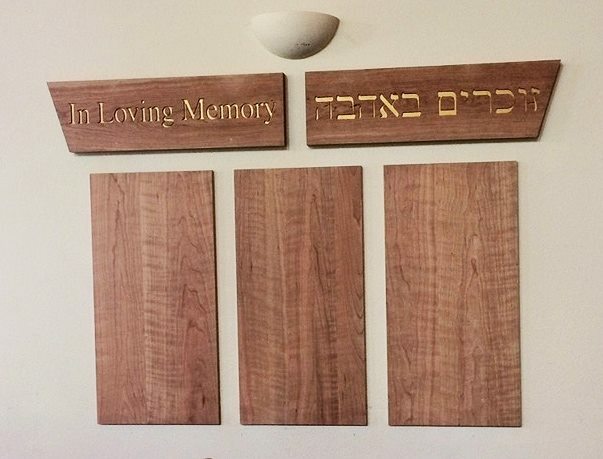 Now you can remember your loved ones on our beautiful, new Memorial Board. 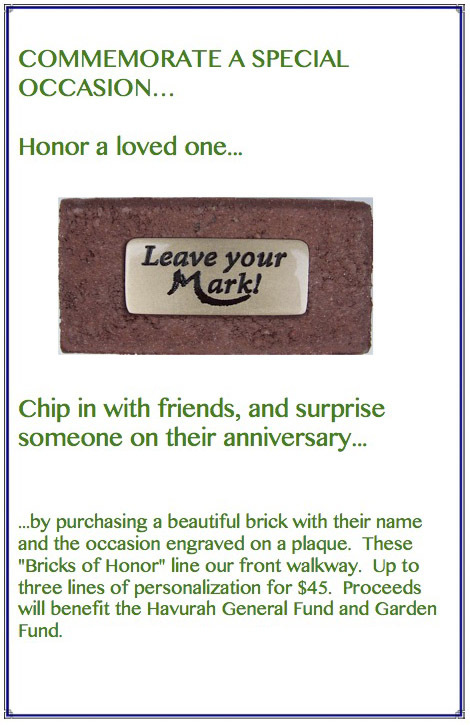 CLICK HERE to download an order form for dedication plaques. Rabbi David says, “I figured out that the Havurah could be earning more than $4,000 each year with absolutely no effort on the part of our members and friends. Well, actually there is some effort. Signing up to eScrip will take you about six minutes, and updating all your old credit cards on a script will take you three minutes. I just updated my own credit cards, and it took me a whopping three minutes! This company called eScrip has been around for decades supporting thousands of schools and nonprofits all around the country. Their website is totally secure and there is no risk and entering your credit card numbers. Except for this lapse of mine in the last two years Debbie and I have been supporting the Havurah for 20 years with eScrip. Please join us! Fundraising is challenging, and were always looking for ways to keep it simple and easy for members and friends to support her wonderful synagogue. Here’s how it works. Once you register your credit cards all you have to do is go to one of the to spinning stores. Between 1 to 5% of your purchases will be sent to the Havurah. It’s amazing! It’s simple! You don’t even have to know the story your shopping and is a participating merchant. That’s how simple it is! It all happens automatically. But you have to register your credit cards for this to work. Please, please, please, register now at http://www.escrip.com/index.jsp or if you are already a participating member and be sure to go on their website to update your credit cards. Here are just a few of the participating merchants that will donate to the Havurah with your purchase. Please remember you don’t have to even know if a merchant is participating: Nordstams, GAP, JCrew, Safeway, Walgreens, Home Depot, Amazon, Target, Walmart, Office Max, Priceline, Apple Store, Macy’s, and hundreds of other brick and mortar and online stores. CLICK HERE to see the list of participating restaurants. CLICK HERE TO SIGN UP. Escrip has been around for many years and is very secure and safe. The Havurah’s ID is 6748395. Signing up is simple. Contact Ayala with questions. When you register your card, the Havurah earns a % when you shop in participating stores, such as Best Buy, Market of Choice and more. 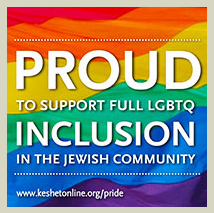 When you do your shopping at AmazonSmile, Amazon donates 0.5% of the purchase price to Jewish Community Havurah Of Southern Oregon. CLICK HERE AND Bookmark the link and support us every time you shop. ALL donations support our school. Please keep bringing in your old cell phones, digital cameras, inkjet cartridges, etc. Help the planet and the Havurah – keep these items out of the landfill! Safe, Secure & Smart Way to Give. Create your free iGive account. All you need do is shop through the iGive.com website, newsletters, or install the optional iGive Button* to make sure you never miss an opportunity to raise money when you shop online. It’s all automatic, and it’s all free of charge. iGive lets you control your membership information with a private password. You can review your store visits and purchase/donation history, and confirm the total amount raised and distributed to your cause. iGive values your privacy and will never release shopper information without consent. And there are no hidden fees or extra costs when you shop through iGive. One Havurah member who recently joined iGive exclaimed how effortless it is – when you download the iGive button that’s all you need to do. When you browse a shop online that participates your donation is automatically recorded. That simple! Are you celebrating one of life’s moments? Birthday or Anniversary of a family member or special friend? Sponsor an Oneg (Friday night Kiddush) to honor a joyous occasion or in memory of a loved one, by making a donation of $26 (double love) or other multiples of $13. Contact Ayala at ayala@ashlandhavurah.org to pick a date.